This project involved a couple of days of testing and development, a day of rehersal and refinement and finally a (long) day filming! It was great fun, but Big Traks are not as accurate as the director had hoped! 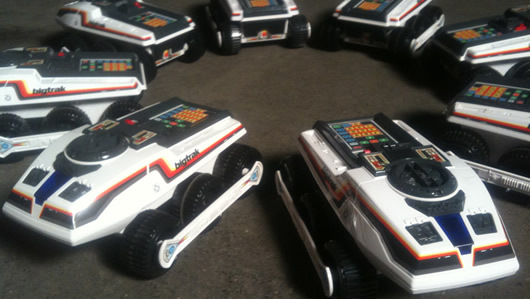 The Big Traks all operate at different speeds depending on battery condition! They don't store the programs either. There was no time on the day to test the programs, so you just punched them in and hoped. Any mistakes spoiled a take! The action was filmed at 100 frames per second so that the footage could be played with in post. At 100 fps the director had the flexibility to ramp the frame rate when he wanted to give bounce to the movement and syncronise the action to the beats. The big traks performed well within their capabilities. So whilst not the most accurate of movements they were atleast repeatable! Kinda! The biggest problem was how the big traks worked as the batteries went low. New batteries made the big traks move with a bit more gusto! There were LOTS of takes, but thankfully mostly down to the Big Traks and timing rather than the programs.